It’s all about strong passwords, but what is a strong password? To put it concisely: It’s all about strong passwords. But what is a strong Password? There are lots of advices how a build a strong password like ‘#Q7fr%78’. Unfortunately those passwords are really hard to remember and to input. Some days ago I watched a webinar about WordPress security where a different approach was presented. 26 to the power of 4 = 26 x 26 x 26 x 26 = 456976. That takes about 0,2 milliseconds on a desktop computer with Intel I7 processor for cracking. Four characters are definitely too short! 26 to the power of 12 = 95428956661682200, and the time to crack is about 1.5 years. The yellow marked shows the one-year-time-to-crack for the character set. 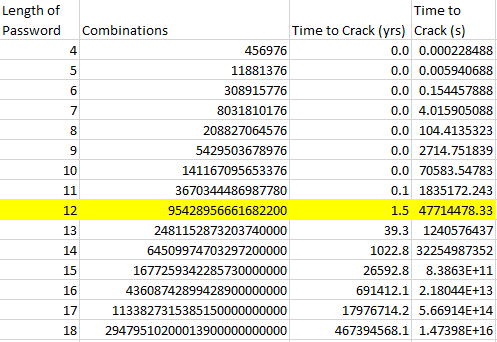 The one-year-time-to-crack is the password length where an attacker with an Intel I7 processor based computer needs one year to find the combination with a brute force attack. For our plain character set the one-year-time-to-crack is 12. With character set ‘a..z A..Z0..9’ the one-year-time-to-crack is 10, With the complex character set ‘a..z A..Z0..9 _-%$§&/()#=?’ the one-year-time-to-crack is 9. Even with the complex character set you should use at least 9 characters. As a result we get: It’s all about the password length! The influence of the character set is negligible. Even with the plain character set one could create hard to crack passwords. I would recommend to use at least 14 characters even with the complex character set. Just to be ready for faster CPUs and to anger the NSA! How to build strong passwords? This password is rated ‘Strong’ by the Microsoft password checker. Never use the first words of your favourite song or something you published on Facebook or elsewhere, because an attacker will do some social engineering and use this results first. This version is rated ‘Best’. This entry was posted in Opinion, Survival tips and tagged password, strong passwords on October 11, 2014 by Klaus Jochem.